Note - This article first appeared in pamphlet No. *** produced by the Creation Science Movement who have given permission for it to be published on this website. Most creationists are familiar with the stories of the Flood in folk tales from around the world. This information was vividly set out in a chart drawn up by Byron C. Nelson . This shows that the events of the Flood were so awesome that they were retained in the memories of the various nations, even after the dispersal from Babel, such that they are part of their folk stories to this day. Nelson drew up his chart which showed that even on the far side of the earth from Babel, the main outlines of the events are still remembered. This all points to the fact that the Flood was a real event in the history of mankind. If Joshua actually stopped the sun moving for a whole 24 hours as recorded in Joshua 10:12-14, [Location - Point A on chart]. surely this would have similarly been noticed by men all round the world? Bouw, like Nelson, has collected a number of examples of folk stories in which a long day (or long night, depending on where the nation was living on the earth's surface) is still retained. We give a synopsis of some of the records that he obtained. Point B. Egypt. The Greek historian Herodotus recorded that when he visited Egypt, the priests there showed him an ancient manuscript that told the story of a day that lasted twice as long as a normal day. As they had accurate water clocks that could record time, they could easily record that a long day had taken place. Point C. Egypt. Fernand Crombette translated some Egyptian hieroglyphics that said - "The sun, thrown into confusion, had remained low on the horizon, and by not rising, had spread terror amongst the great doctors. Two days had been rolled into one.... They made the moon stop in a small angle at the edge of the horizon. In a small angle on the edge of the horizon, the sun itself, which had just risen at the spot where the moon was going, instead of crossing the sky, stayed where it was. Whilst the moon, following a narrow path, reduced its speed and climbed slowly, the sun stopped moving and its intensity of light was reduced to the brightness of daybreak." The rest of the account records a exceptionally high tide that washed boats into piles of wreckage, drowned fisherman, flooded much of the land, etc. Point D. India. This is not a record but a prophecy in the Brahman Yast, one of the books in the Indian Avesta. This said that the sun would be commanded to stand still for ten days in about AD 1200. Although the date is completely wrong, the statement may be a reference to the Chinese record of the same event and the ancient historians have them confused. Point E. China. Gill, writing in 1810, quoted from a manuscript that unfortunately appears to have been lost. This said that in the time of their seventh Emperor, "..the sun did not set for ten days... and though the time of the sun's standing still were enlarged beyond the bounds of truth, yet it seems to refer to this fact, and was manifestly about the same time; for this miracle was wrought in the year of the world 2554...."
Points 1-5. North America. Several North American Indian tribes have accounts of long nights. The Ojibways, Wyandots and the Bungees tell of a long night. The Omahas tell of the sun being caught in a rabbit's trap and only released just before dawn. The Dogribs tell of the sun suddenly becoming dark at noon. Point 6. Mexican Indians. They tell of a long night. Point 7. Aztecs. They have a legend of the sun not appearing for a very long time, so a conclave of the gods was called and a sacrifice made. Point 8. Quiche Mayans of Guatemala. " They did not sleep; They remained standing and great was the anxiety of their hearts and their stomachs for the coming of the dawn and the day.... 'Oh... if we only could see the rising of the sun.'" Point 9. Peru. The sun was hidden for nearly 20 hours. Point 10. West Africa. A West African story of a long night, it said that the night lasted too long because the owl overslept and did not awaken the sun. There is always the possibility that stories of long nights and long days could have arisen over time in the folk stories of ancient tribes. Many have fantastic elements and such events as a very dark day could have been exaggerated to become an extension of the night, and this could give rise to the story of a very long night. It is a little more difficult to imagine how a similar story of a long day could have been prompted, but human imagination can do much on such lines. Now if this were to be the case, then we would expect such stories to be randomly distributed around the earth. But this is not what we find when these records are examined relative to their position around the globe. Gerardus Bouw printed out the curved shape of the night shadow that passes around the earth each day, as shown on the diagram. It can be seen that this can be moved to a position such that ALL the "long night" stories can be covered by the night shadow, and ALL the "long day" stories are in the daylight section. This proves that all these stories were correctly positioned according to the location of the nation relative to the day and night parts of the shadow. It could not be a coincidence. This is surely proof that Joshua's "Long Day" actually took place and was recorded by many nations around the whole earth when it happened, but there has been some exaggeration of its length as it was handed down. There are a few records that do not conform to this interpretation, but some can be more easily aligned with Hezekiah's sign of the shadow on the sundial returning rather than Joshua's long day. The N. American Indian Cherokees have a long night lasting several months which would confirm other N. American stories. Strangely, they say that the sun stayed in a cave for months and had to be tricked out, which is identical to the Japanese story of a long night. The position of the shadow cannot be accurately determined from the scattered locations of the tales; there is a small but limited range of positions it could have been that would still cover the light and dark locations correctly. There is, however, one other location that gives its position more accurately. Location X. Fiji. Sir James Frazer records that on a hillside on an eastern island of Fiji the natives tie the weeds together "to stop the sun going down" as it is said that it once did. This places the edge of the shadow at this point, giving a more accurate position for where the sun stood still. From this, Bouw calculates that the time was about 9 am. in Israel. There is a small correlation with the West African story. The owl is said to have failed to wake up the sun. This suggests that dawn was about to break but stayed like that for a whole day longer. This would place it near the edge of the dark shadow which is its position in the chart. What date did it occur? The Chinese account that Gill quoted stated that it occurred "in the year of the world 2554." Bouw says this is the identical year - 1448 BC - in his chronology for the date of Joshua's Long Day. In addition, the Peruvian story (Location 9) took place during the reign of a king who ruled about 1400 BC. May 8th - 15th in 1448 BC starting at about 9 am for Joshua's Long Day. The word used for the sun was that it was "stopped" (Hebrew damam = to be still, die ) whilst the word used for the moon is slightly less strict (amad = to tarry, delay, remain, continue, abide, endure, persist, be steadfast) which allows some movement. Crombette's translation of the Egyptian hieroglyphs (Location B) specifically mentions the fact that the moon "reduced its speed and climbed slowly." 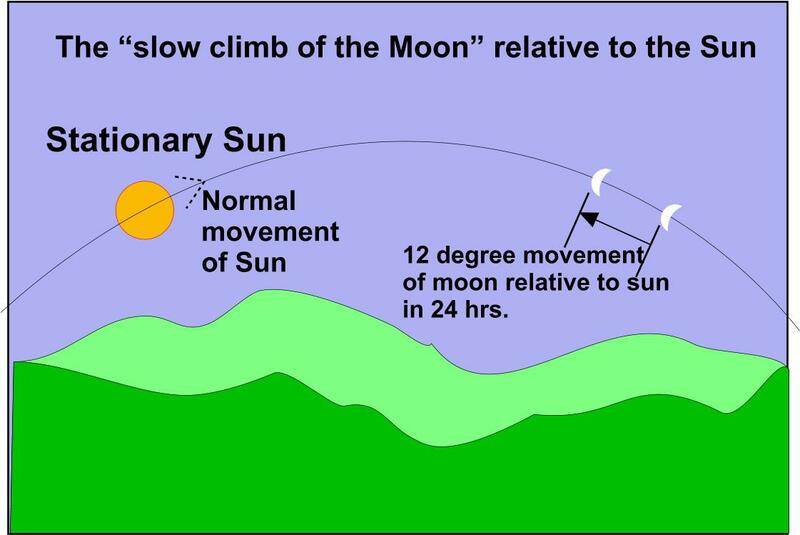 This would be in precise accord with the moon still continuing its slow relative movement to the sun as it takes 29.4 days for one complete revolution of the moon around the earth; i.e. it moves about 12 degrees relative to the sun each day. It is this that gives us our phases of the moon and our changing tides. Again, in this small detail, there is further confirmation of this event.